From the time I start typing until the time I hit publish I give myself 10 minutes to write these reviews. I do not include time finding the cover image in my 10 minutes. When students walk into my classroom on the first day of school they bring with them their story. All of their stories are different. Some are like mine was when I was a third grader: middle class, two parent household, a couple of siblings, a love for video games and spots. Some might live with a loving grandmother and a house full of cats, while others may have a story too sad to share in a blog post. My point is we all have a different story. We all have a story that we own, we live, a story in which we decide which parts to share and which parts to protect. I say these things in this review because it is books like Circa Now that help us understand each other. Sure this a book that is genre-tricky, with amazing characters, and beautifully crafted plot, but what I love most about this book is that it allows me and my students to better understand, support, and love other. Early in the book 12-year-old Circa’s dad is killed in a storm. Watching Circa and her depressed mother deal with their grief helps me to better understand the students in my classroom that are dealing with grief of their own. You see, in my 32 years on this planet I have lived a bit of a charmed life. I’ve never had a lot of money, but I’ve always had enough. I’ve lost family members, but I have never seen the people closest to me battle illness. 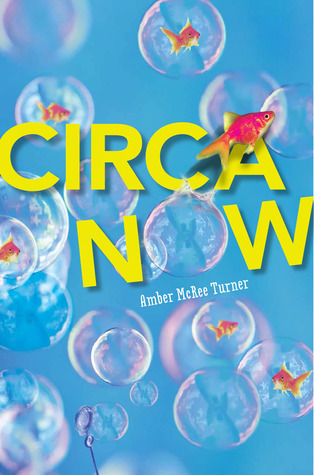 Like my students, I need books like Circa Now to help me see a way in which grief can affect a family. You should probably check out Circa Now when it hits stores May 27th. I’m guessing that a child that you know needs this book. P.S. I didn’t even get a chance to talk about two of my favorite things in this book: Miles and trying to figure out the magic (tricky-tricky). Fans of Laurel Snyder’s Bigger Than a Bread Box are going to eat this one up.